A display in Folk’s front window, which faces Kittery’s Wallingford Square. 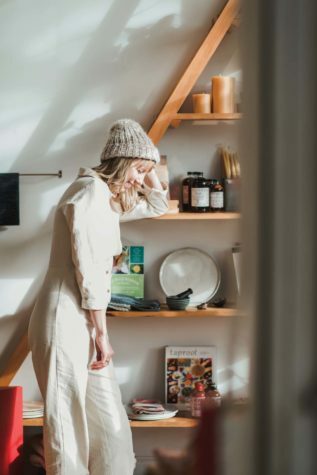 Amelia Davis in a jumpsuit by New York designer Ilana Kohn, whose clothing Davis carries at Folk. For Folk’s apparel collection, Davis chooses pieces that are well-made, modern, and versatile, mostly from independent design houses in New York and Los Angeles. 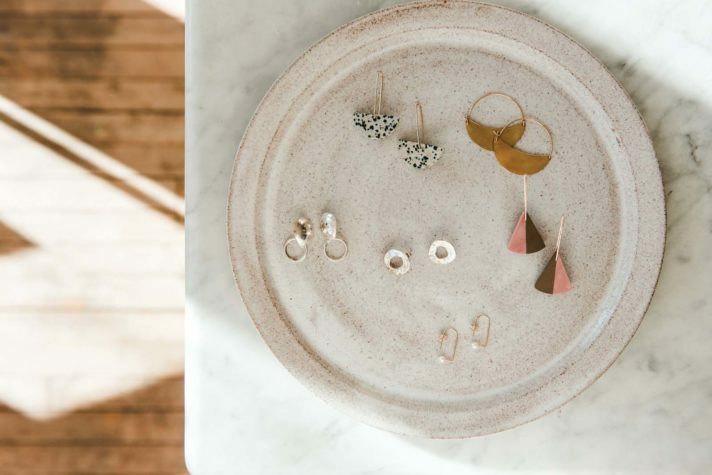 A display of jewelry includes spotted dalmatian jasper halfmoon earrings by Pacific Northwest artist Alison Jean Cole and brass crescent hoops made in New York City by Lila Rice. 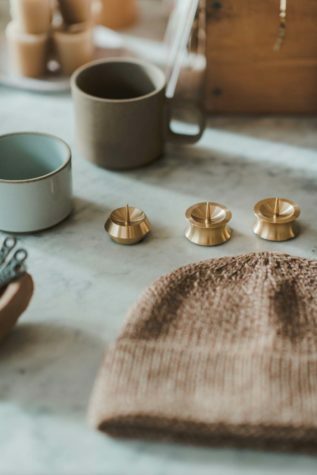 An Alpaca beanie bmade fair trade in Peru, solid-brass candle holders from Japan, and a Hasami Porcelain mug. 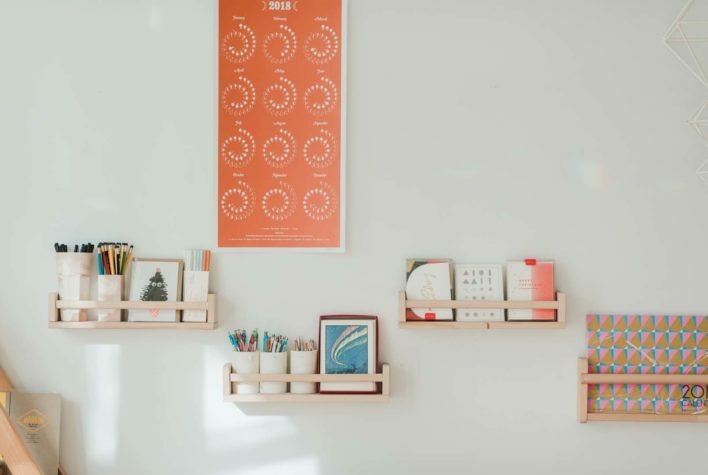 Calendars, cards, and writing implements for stocking the stylish desk. 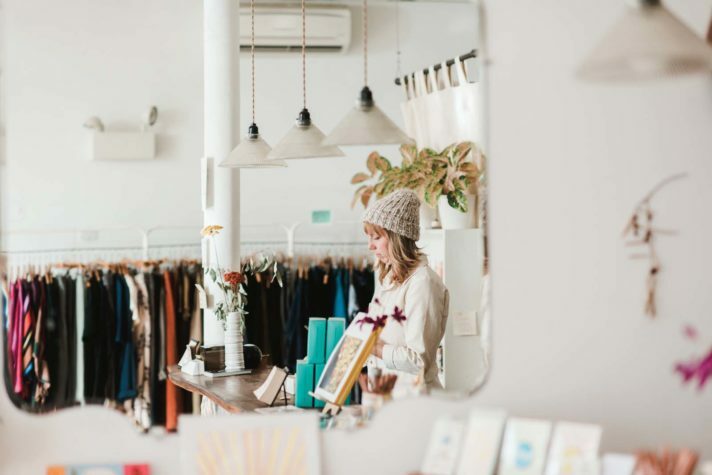 Before she opened the shop, Davis produced a small line of leather goods and jewelry called Kin of Kin. The name, Folk, reflects this earlier project as well as the connections that have always been significant in her creative life. “When I first opened, 80 percent of what I had came from people I knew,” Davis says. 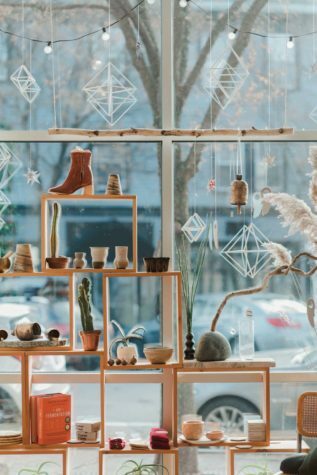 While she now sources some of her products at trade shows, “There’s still a lot I hear about through word of mouth.” Her original plan for the store included selling items of her own design, which proved more complicated than she expected given the challenges of running a business as a sole proprietor. Now that her mother is retired, however, she serves as Folk’s “resident seamstress,” stitching up small items such as balsam sachets and soft toys. Together with a friend, Davis also designs an annual calendar featuring the phases of the moon. Davis’s style may be far removed from Morris’s romantic flowers and ferns, but the nineteenth-century designer would have approved of her creative spirit, the strong work ethic she attributes to her parents, and her philosophy in both choosing items and curating her shop. 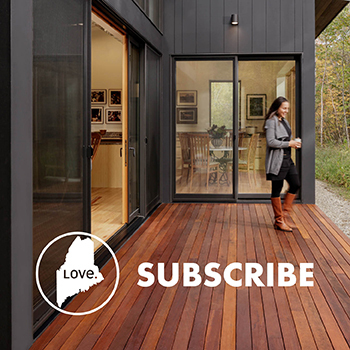 At Folk, the useful and the beautiful are two halves of a well-ordered whole. 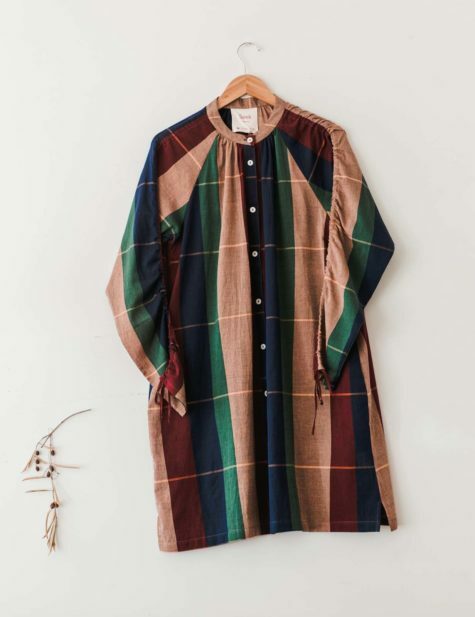 The Cy shirt dress in handloomed cotton is made sustainably in India for Seek Collective.